Alternate directions: Take Hwy 98, west of Hattiesburg, MS to Old Hwy. 11 (first stop light past Petro Motors), turn left. Go to second stop sign, turn right (between Exxon station and Methodist Church). Go about 3 miles, turn on paved road just before a bridge with a right curve in the road just past it. 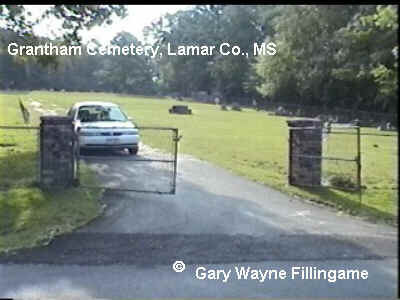 Go about 1/2 mile to Grantham Cemetery on left.